Custom Tiles allow you to make different components for your games. You can choose from four different tile shapes – Box (Square), Hex, Circle, and Mat (Rounded corners). Custom Tiles do not support transparency. If you’d prefer to have objects that use transparency, then check out our Custom Tokens. Click on OBJECTS -> COMPONENTS -> CUSTOM -> TILE. Choose which shape you want for your tile. Choose an image on your computer to import or upload your images to a host and input the URL manually. You can choose a top and bottom image. If you don’t choose a bottom image, then the top image will automatically be placed. You can adjust how thick you want your tile to be. If you want your tiles to be stackable (like poker chips), then you would check this box. If you want your tile to match the image’s aspect ratio, then check this box. 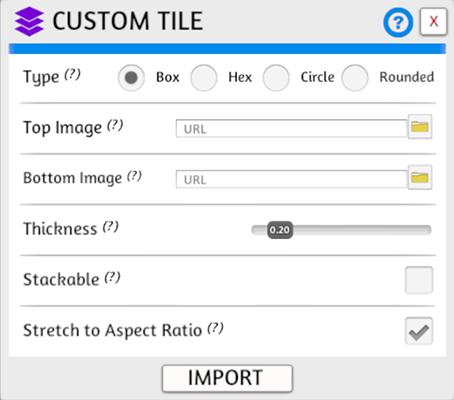 Press import and watch your custom tiles come to life! If you’d like to edit your tiles, just right click and choose CUSTOM in the Contextual Menu. You can now make any adjustments needed here.